On Sunday we loaded both kids up and headed out to Little Sisters where we were meeting Grammy Janet, Adam, Becky and Colton, Leann and Deonte for lunch with Nannie. On the menu, Winstead's, one of Nannie's favorites. 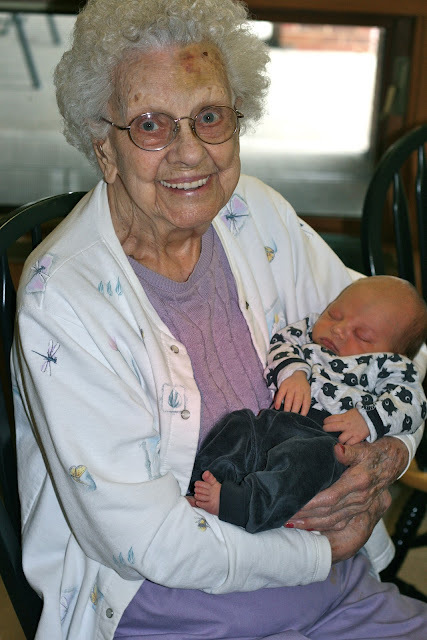 This day was a little more special than our other visits, Nannie would get to hold her newest Great, Great Grandson for the first time. As Kaden and Colton ran around chasing each other with a football, Nannie sat very quietly and just held our Lil Logie. Nannie is 96 and it means the world to Justin and I that we were able to introduce our boys to her and that they have the opportunity to know who she is. I am currently reading, Heaven is For Real, which is about a 4 year old boy that was on death's door and talks about how he visited heaven for 3 minutes and what Jesus told him... So far my favorite part of the book talks about how his Pop (dad's grandpa) came up to him in Heaven and asked if Todd was his dad and then he proceeded to tell him that he was Pop. Although the little boy didn't know who he was at first, Pop knew instantly who the little boy was. The fact that Justin's dad, Dave, my Grandma Hartley and Grandpa Earl will know who Kaden and Logan are when they enter Heaven and that Audria, my mom's mom, will know who I am and open her arms to me makes my head spin but I know that all things are possible with God. We couldn't ask for better guardian angels for Kaden and Logan.